It allows to change the behavior of a compiled program without having to recompile it. This is just the transcription of my personal notes about the first topic. Hopefully, in the future I will also transcript the notes I have taken regarding the rest of topics. Most of the information has been taken from the Lua Wiki sample code and updated (if needed) using the Lua 5.2 reference manual. 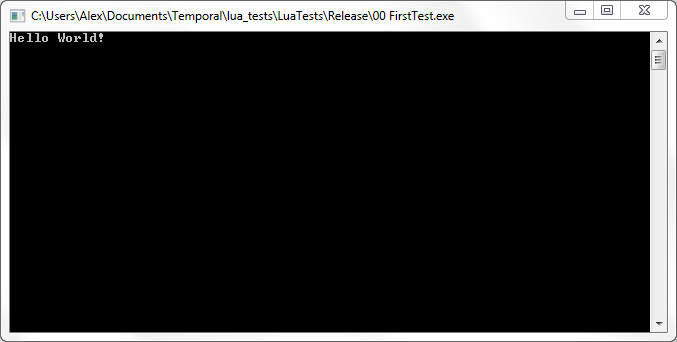 I am using Lua version 5.2.1 downloaded from its official page and compiled in Microsoft Visual C++ Express 2010. I am not covering the compilation process of Lua — it is well documented online — nor the meaning of the Lua code beyond its basic behavior. Create a Lua state — like a Lua virtual machine in which our script will be running. Load the needed Lua libraries to run the script. The project must link to the Lua libraries, that have been compiled previously, and must have access to the Lua header directory, since we will be including the <lua.hpp> file. We also assume that the C++ executable is generated in the same directory as the Lua script and that the script is called <helloworld.lua>. There is no mystery to it. The only step is to store in a pointer the newly created Lua state returned by luaL_newstate(). Afterwards we can use that pointer to refer to the Lua state. The second piece is to load the needed libraries. This is a bit more tricky. Every Lua library — even the ones generated by yourself — are opened by a C++ function and stored in the Lua state as a global table with a given name. Therefore, our first step is to define the name and opening functions for the desired libraries. Since our hello-world script is so simple, only the base Lua library is needed. We define “base” as the name of the base library, which is opened by the luaopen_base() function. Then, we load every selected library by calling its loading function with our Lua state pointer. The lua_settop() sentence just ensures that we discard any variables that may be populated into the Lua stack. You only have to provide the Lua state in which you want the script running and the filename — with full path if it is not in the same directory of your C++ executable — of the Lua script. This will remove any memory used by the Lua state — except for some tables in rare cases. That is the one of the most simple examples of embedding Lua into C++ programs. Stay tuned for further, more complicated examples. Read the next tutorial! This is all really great info; thanks for sharing. Could you show how you would handle catching exceptions in your C++ code? Reading luaconf.h has not been particularly illuminating. I’m sorry that’s the only thing I can do for you, but I will explore it in the future and think about making a small tutorial out of it. Muy buena serie de tutoriales!